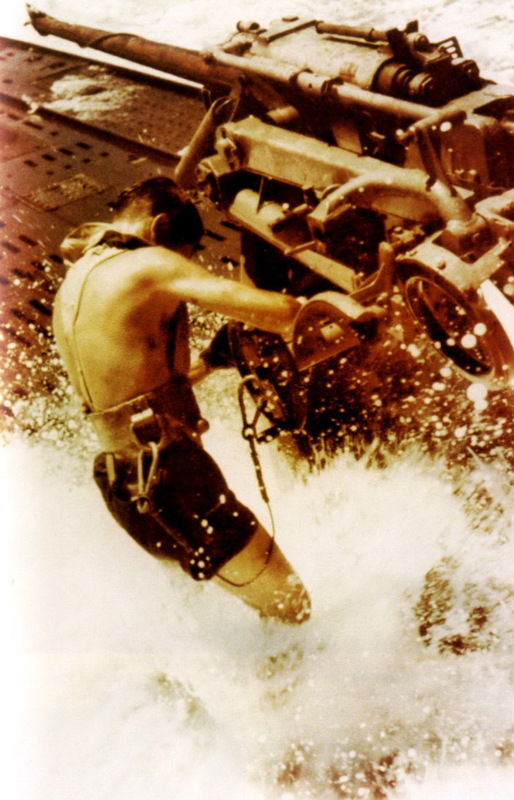 Maintenance work on the 37mm quick-firing deck gun above the U-boat in the rough sea, with the man wearing both lifejacket and safety harness. The German U-boats of types I, VII, IX and X had a very powerful secondary weapon which was the deck gun. Each boat had one in front of the conning tower and with a good crew they could fire 15-18 rounds a minute. Often used to finish off damaged vessels or sink smaller ships the gun normally had a crew of 3 to 5 and was usually commanded by the second watch officer (IIWO). In order to use the weapon, the U-boat had to be on the surface naturally and it was normally not used when aircraft were suspected to be around. It required a line of men (3 which on the deck) to transport the ammunition from the main locker below the control room to the gun. The used rounds were taken back into the boat. The U-boats had a small water-proof ammunition locker for the gun on the deck in order to be able to start firing almost immediately when the order was given. The smaller Type II coastal U-boats had no deck gun. In 1937 plans were drawn up for type XI U-boat cruisers. Those huge boats would have had 4 pieces of 12,7cm guns in two separate towers. They were not built.